Trump’s favorite attack dog, Rudolph Giuliani is squarely in the running for a cabinet post. Many rightfully shudder at the thought of him as Secretary of State or Attorney General. While Giuliani earned a great deal of good will for his soothing but forceful tone following 9-11, most New Yorkers remember him as an autocratic leader who openly scoffed at the Bill of Rights. Giuliani believes that many of the problems of society are rooted in an unregulated individualism that has resulted in a moral deregulation that has allowed crime and disorder to run amok, threatening the “quality of life” of everyone else. When he took office in 1994, Giuliani said, “Freedom is not a concept in which people can do anything they want, be anything they can be. Freedom is about authority. Freedom is about the willingness of every single human being to cede to lawful authority a great deal of discretion about what you do.” This could be seen clearly in his efforts to stamp out disorder using the “broken windows” theory. Time and again Giuliani attempted to restrict protests, artistic expression, and public behavior that he found distasteful or politically threatening. All of which is a clear violation of the core precepts of the First Amendment. During Giuliani’s eight years as mayor, he was sued for violating the First Amendment more than any other past mayor. He was sued 21 times just by the New York Civil Liberties Union, which went on to win all or a significant part of 19 of those cases. These cases dealt with denials of the right to protest, persecution of whistleblowers, abridging freedom of speech, and the refusal to release public documents to the press and public. In 1998 the NYCLU challenged the constitutionality of the Giuliani administration’s refusal to permit a procession of yellow cabs to proceed across the 59th Street Bridge and through midtown to City Hall to protest changes to rules governing drivers of yellow cabs. Giuliani denied them a march permit and publicly threatened to pull the licenses of any drivers that participated. He proceeded to pull the licenses of several protesting drivers. A federal trial court held that the refusal violated the First Amendment and ordered the city to permit the procession to take place. In Housing Works v. Safir, the NYCLU challenged the constitutionality of Giuliani’s policy of not allowing more than twenty-five people on the steps of City Hall for a press conference. In July 1998, the United States District Court ruled that the policy was in violation of the First Amendment. The City subsequently attempted to close the steps entirely to all protest activity and the NYCLLU went back to court and obtained a second court order blocking the policy on behalf of Housing Works, so it could hold its annual World AIDS Day event. In 1998 and 1999 Giuliani tried to first restrict the size of and then totally block the Million Youth March in Harlem based purely on his political disdain for them. Local civil rights lawyers backed up by the NYCLU successfully overturned restrictions on the march in both years. Giuliani’s attempts to block Demonstrations by the October 22nd Coalition Against Police Brutality, and the KKK were similarly overturned by the courts. The NYCLU also brought several successful suits in defense of whistleblowers within the NYPD and other agencies and challenging blanket bans on city employees speaking to the press. In Latino Officers Association v. City of New York, they successfully argued that the City could not prevent Latino officers from marching in uniform at political demonstrations. In Walton v. Safir they successfully overturned the dismissal of a police officer employed in the Street Crimes Unit who had been fired after speaking publicly and critically about practices of Unit after four of its members killed Amadou Diallo in February 1999. Giuliani also repeatedly tried to restrict artistic expression in the City. He attempted to displace street artists from city sidewalks by creating restrictive regulations and excessive fees, both of which were struck down by the courts. Possibly his most high profile assault on expression was his effort to cut funding to the Brooklyn Museum in 1999 because of an exhibit that he described as “sick” and “disgusting.” The museum is privately owned, but the land on which it sits is leased from the city, which also pays for its maintenance. When they arranged to show an exhibition of young British artists Chris Ofili that included a portrait of the Virgin Mary that used elephant dung and small depictions of human genitalia in the background, Giuliani tried to block it. Just days before the opening, the Mayor’s Office informed the museum that the city would stop all funding for the museum if the exhibition were not canceled. When the Museum resisted, Giuliani threatened more and more punishment, including replacing the museum’s board of trustees, canceling the lease, and taking possession of the museum building. At one point he said he would not “have any compunction about trying to put them out of business.” Giuliani’s transparent attempt to suppress speech based on his own personal distaste was immediately blocked by the courts. In a 2001 reprise, Giuliani attempted to block another Brooklyn Museum exhibition “Committed to the Image” containing the work of 94 contemporary Black photographers. He threatened to create a “decency task force” to judge that and other public art works in the city, implying that controversial art would lose public funding. The piece that inspired Giuliani’s anger was a photograph by Renée Cox entitled “Yo Mama’s Last Supper,” based on DaVinci’s “Last Supper” in which Cox placed herself naked in the central position of Christ. In the face of public outrage, Giuliani withdrew the threat. Ironically, Giuliani’s one attempt to defend the First Amendment showed a profound misunderstanding of the Amendment. In 2015, Giuliani criticized Trump’s proposal to ban all Muslims, stating that there was no question that with such a ban you “violate the First Amendment.” However, his interpretation shows something very different: “Once the government sets up a system, the government cannot discriminate in the way it applies that system. So the minute the government sets up an immigration system it can’t use religion as a test…for why someone can’t come in.” What Giuliani describes is not a violation of the First Amendment’s protection of speech and assembly, but of the 14th Amendment’s requirement of equal protection. 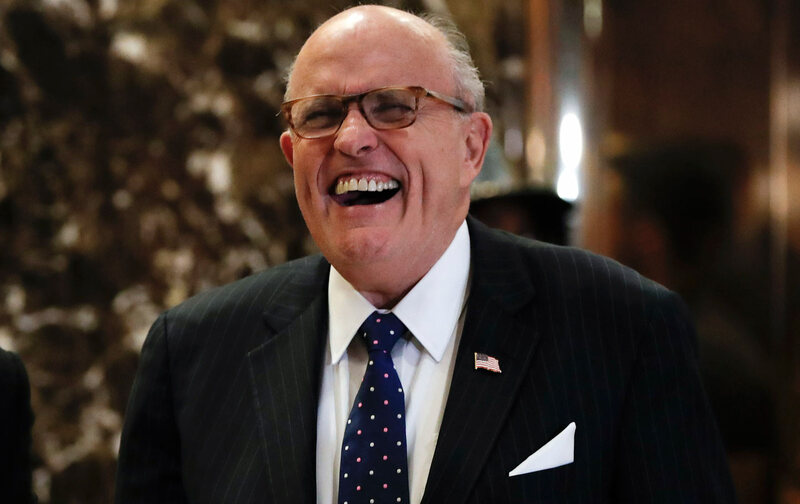 Giuliani has also expressed support for Trump’s desire to bring back Stop and Frisk Practices despite a recent Federal court ruling against its excessive use by the NYPD. Giuliani rightfully points out that the court’s ruling only targets its excessive use as unconstitutional, but it is exactly those excesses which Trump has pledged to “bring back.” At its height he NYPD was making over a half million stops a year that the court said lacked the 4th Amendment requirement of “reasonable suspicion” and were carried out in a racially discriminatory fashion in violation of the 14th Amendment. Giuliani also supports electronically tagging people suspected of connection to terrorism. He proposed placing tracking devices of anyone on the US’s Terror Watch List, despite the fact that there is no due process in the formation of that list. The government can place anyone it wants on that list without any oversite and people on the list have little recourse to challenge it. Many on the list are not even aware of it. Finally, Giuliani seems largely unconcerned about the 8th Amendment’s prohibition on “cruel and unusual punishments.” In 2011 Giuliani defended Michael Mukasey’s appearance before Congress in which he refused to say whether waterboarding was torture. Giuliani said, “I’m not sure it is, either, it depends on how it’s done. It depends on the circumstances. It depends on who does it.” He went on to attack media coverage of the issue, arguing that “liberal newspapers” have exaggerated its brutality. And if that isn’t enough, Giuliani also supports the use of the death penalty. Can we really stand an Attorney General or Secretary of State with such a terrible record of respecting the Constitution, which he would be sworn to uphold? Unfortunately, in Trump’s America, we just might have to.